Mobile technology has transformed our lives, and personal genomics is revolutionizing biology. But despite the availability of technologies that can provide wireless, personalized health care at lower cost, the medical community has resisted change. In The Creative Destruction of Medicine, Eric Topol-one of the nation's top physicians-calls for consumer activism to demand innovation and the democratization of medical care. 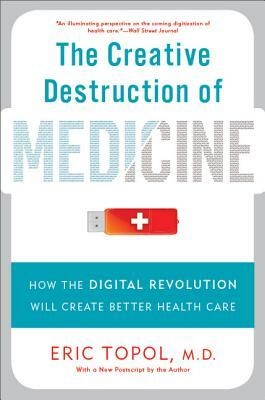 The Creative Destruction of Medicine is the definitive account of the coming disruption of medicine, written by the field's leading voice. Eric Topol, M.D. is the director of the Scripps Translational Science Institute and co-founder and vice-chairman of the West Wireless Health Institute in La Jolla, California. He is a practicing cardiologist at the Scripps Clinic and a professor of genomics at The Scripps Research Institute. One of the top 10 most cited researchers in medicine, Topol was elected to the Institute of Medicine of the National Academy of Sciences and has led many of the trials that have shaped contemporary treatment for heart disease.